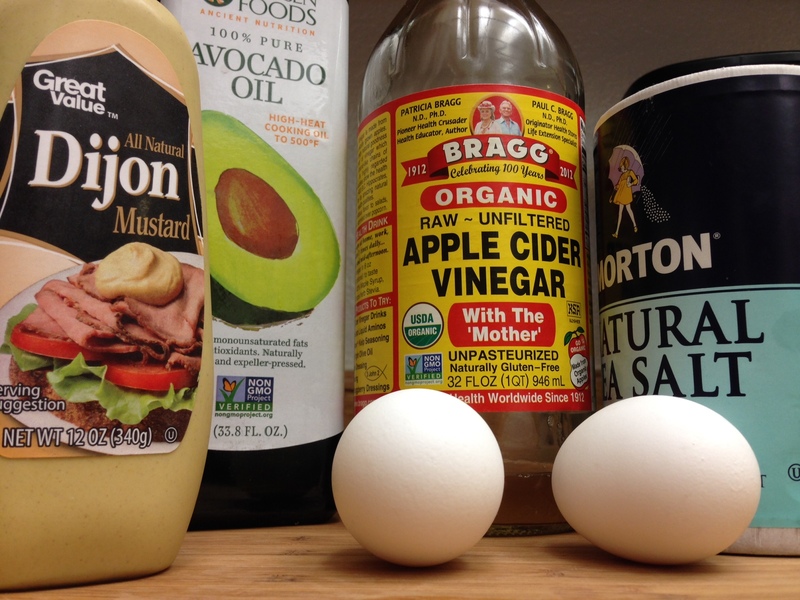 Among mainstream nutrition circles, mayo is often seen as one of the greatest evils, and store-bought mayo truly is. While composed of mainly benign-sounding eggs and oil, it’s the type of oil that makes all the difference. Pre-made grocery store mayo is made of soybean oil, which is highly problematic. At the top of the list are the inflammation-inducing properties of the high omega-6 content, which is a common characteristic of all vegetable oils. On the wider scale, soy is a huge agricultural product, and is subject to the group of problems associated with all that is Monsanto: genetic modification, industrial refining processes (including solvent extraction with hexane; more about that here), and pesticide contamination. It can be mentioned that there are also hormone disrupting properties of soy, courtesy of phytoestrogens; however both soybean oil and soy sauce contain nearly unmeasurable quantities of those isoflavones. If you’re thinking, “I don’t eat mayonnaise by the spoonful. How much damage can a little spread of soybean oil do?”, then take a look at this graph. Even if you don’t have a bottle of soybean oil in your pantry, you are likely consuming much more than you think. Like to eat out? You’ll be taking a hit of “vegetable oil blend” every time, usually a mix of canola, corn, and soy. Use bottled salad dressing? All soy with a dash of canola. Some packaged foods claim they are “made with olive oil”, but they usually only contain a token amount of olive oil and are still overwhelmingly soy-based. And if all that isn’t enough, mass-produced mayo includes added sugar and preservatives to increase shelf-life, appearance and texture. So overall, unless you exclusively eat only homemade foods from scratch with the piety of a Buddhist monk, you’re probably getting veritably doused in this nasty stuff. Taken with that point of view, every little thing you can do to minimize your exposure is a win. On to the good news! Mayo is super easy to make at home with the right tools. 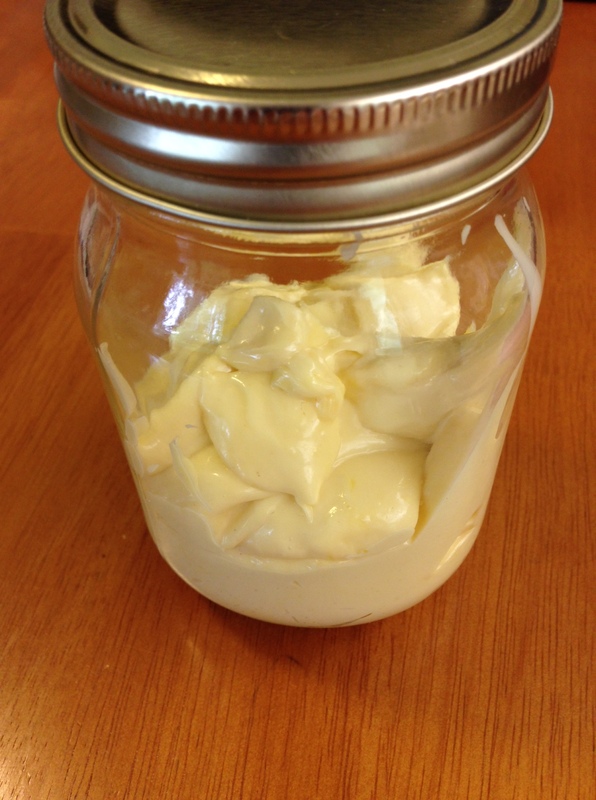 The first time I made mayo years ago, I used olive oil. It works well, but leaves the mayo sort of greenish, and has a strong flavor. Now I use avocado oil, which is available at Costco for a steal. Most importantly, I use my awesome Cuisinart 14-Cup Food Processor. Many appliances can be used: regular blenders, immersion blenders, different food processors, even a bowl and a whisk (though I wouldn’t even use that task as punishment). The most important quality is that the mixture doesn’t heat up during the process, or you’ll end up with a slimy, runny mess. The mayonnaise is not only good for old standbys like using with tuna, egg-salad, or deviled eggs, but is a great base for sauces, dips, spreads, and creamy salad dressings. 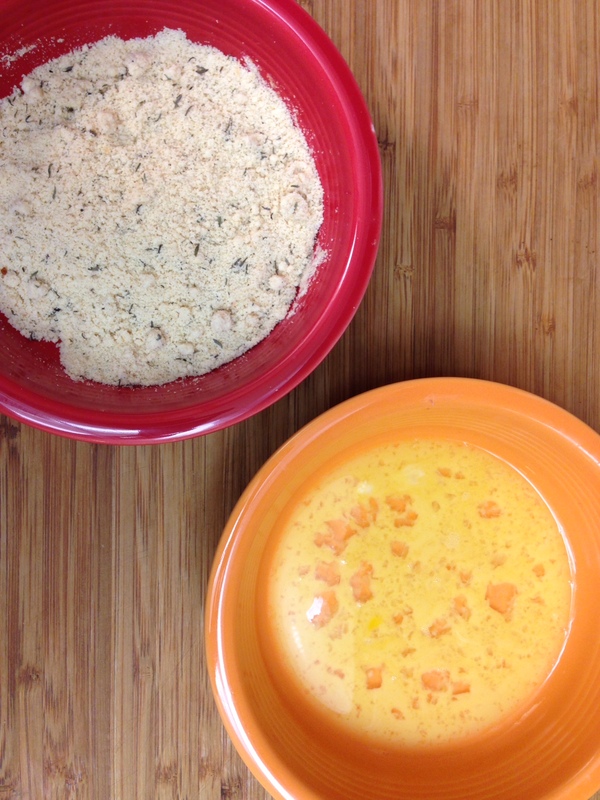 Add the egg yolks, vinegar or lemon juice, mustard, and salt to the food processor or blender and turn on to blend. With the appliance still running, begin slowly adding the oil in a very thin stream. If you have the same food processor I have, you can just fill up the small push tube with oil. It will drain into the work bowl through the small hole. After 1/4 cup or so, you should notice the emulsification beginning. Continue to slowly pour in all of the oil. Once all the oil is in, turn off your appliance right away. Your mayo is done! Store it in a glass jar in the fridge. I have a nasty looking yellowish liquid that looks like…oil mixed with egg. The mixture didn’t emulsify. Check for heat. Is your appliance hot, or is your house very warm? Try cooling the mixture in the fridge for a few minutes, then start again from step one with new eggs, vinegar, mustard and salt, but this time use the chilled mixture as the oil. It mostly looks like mayonnaise, but there’s a layer of oil and egg at the bottom. Just use a spatula to scrape up the layer and mix in with the mayo, then give it another whirl in the food processor for a few seconds to blend it in. The mayo is really firm and a little chunky. It’s overblended, but can still have purpose in life! Store it in the fridge and use it for dips and sauces that call for mixing with creamier ingredients like coconut milk. We drove up to Talkeetna a few weeks ago to visit Denali Brewing for lunch and do a little fishing. While we didn’t have much luck fishing, lunch was definitely a success. I decided to venture away from my usual chicken salad or lettuce wrapped burger and tried their Creamy Cajun: white rice with a creamy tomato sauce topped with chicken, shrimp, and reindeer sausage. It was so good I had to try my own, and I’m pleased to say the first attempt hit the mark! 1. In a medium saucepan, pour in 3/4 c. of the chicken broth. Add the chicken thighs, cover, bring up to a boil on medium heat, then turn down to a simmer. Turn off heat when just cooked through. 2. While the chicken is simmering, grate the raw cauliflower into “rice” using a box grater. Melt 1 tbsp. of the coconut oil in a pan over medium heat, add the cauli and stir to mix the oil through, about 2 minutes. 3. Add the remaining broth to the cauli 1/4 cup at a time, stirring each until absorbed before adding the next. Turn to low to keep warm. 4. In a small saucepan, whisk the coconut milk and tomato paste together over medium heat. Add all of the spices (sea salt, pepper, onion powder, oregano, thyme, smoked paprika, garlic powder, cayenne pepper) and continue to whisk until just bubbling. Pour the sauce into the cauliflower and stir well. 5. Remove the chicken to a cutting board. Using two forks, shred the meat and separate it from the bone and skin (discard them or stick them in the freezer to use for making chicken broth later). 6. 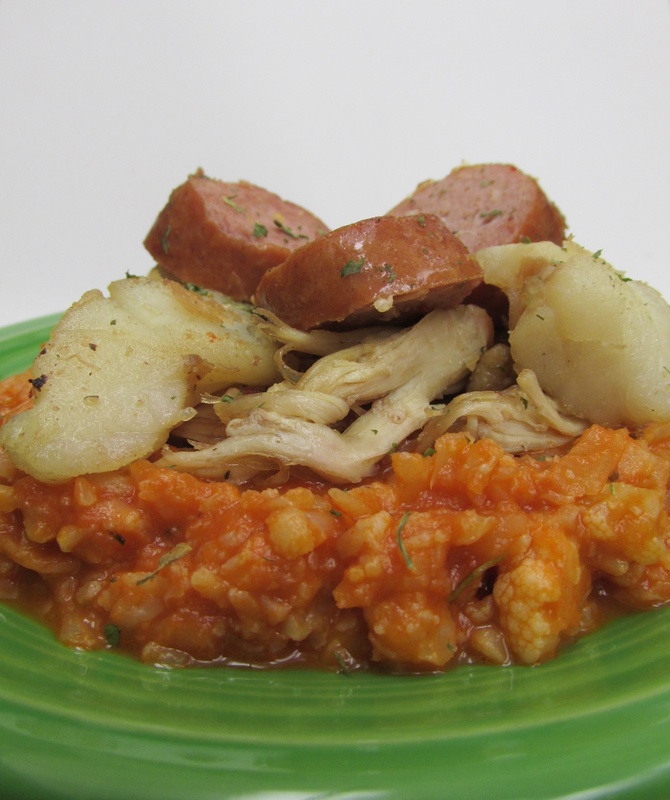 Cut the fish into bite-sized pieces and slice the sausage into rounds. 7. Melt the last 1 tbsp. of coconut oil in a pan (last one!) over medium. Add the fish and stir until just cooked through. Add the chicken and sausage and cook until the edges of the meats just begin to crisp. Season with sea salt and pepper. 8. 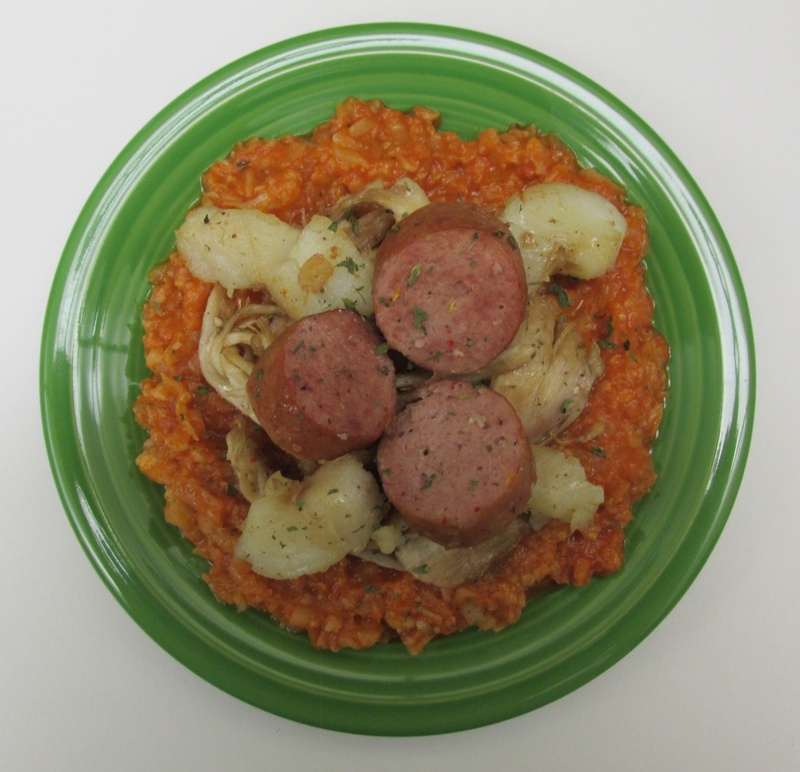 To serve, scoop about 3/4 cup of the cauliflower mixture in a bowl and top with about 1/2 cup of the meats. Garnish with parsley. 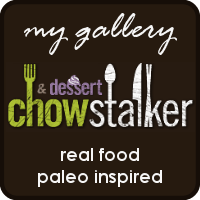 I make a lot of “surprise meals”: dishes that sound “eh”, but taste “wow!” and leave me feeling fantastic. The idea of pork chops, particularly leftovers, for breakfast, doesn’t inspire me much. One morning, I didn’t have bacon or sausage, but was greeted by another cut of pork in the fridge and thought, “Why not?” The results were amazing! 1. In a shallow dish, beat the egg. 2. In a second shallow dish, mix the almond flour and garlic powder, sage, salt, and pepper. 3. Heat 2 tbsp. of the coconut oil in a pan over medium heat. 4. 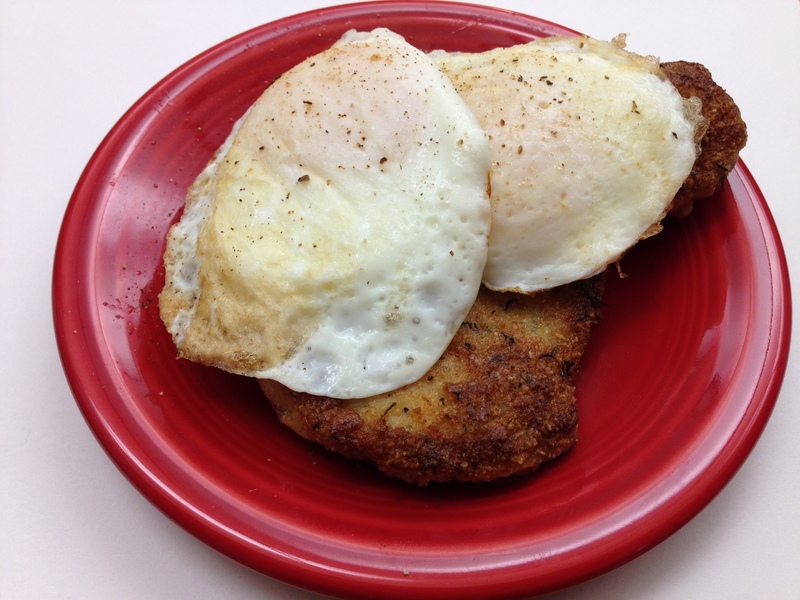 Coat each pork chop in egg, then in the almond flour mixture. 6. Melt the last tbsp. of coconut oil in the pan and fry the eggs to desired doneness. 7. Top each chop with two eggs and season with salt and pepper. 8. Dig in and start your morning super satisfied! My brand new spiralizer showed up on my front porch yesterday, amid a flurry of ringing doorbells, dog barks, and yelling 5-year-olds. I’d been planning on adding this appliance to my kitchen arsenal for well over a year, and finally pulled the trigger. It’s arrival neatly corresponded to the day after zucchini was conspicuously absent from the grocery store, so there would be no paleo pasta to christen it. Instead, I looked to dessert, but I think this dish would be equally good as a side for pork. 1. Melt butter in saucepan over medium heat. 2. 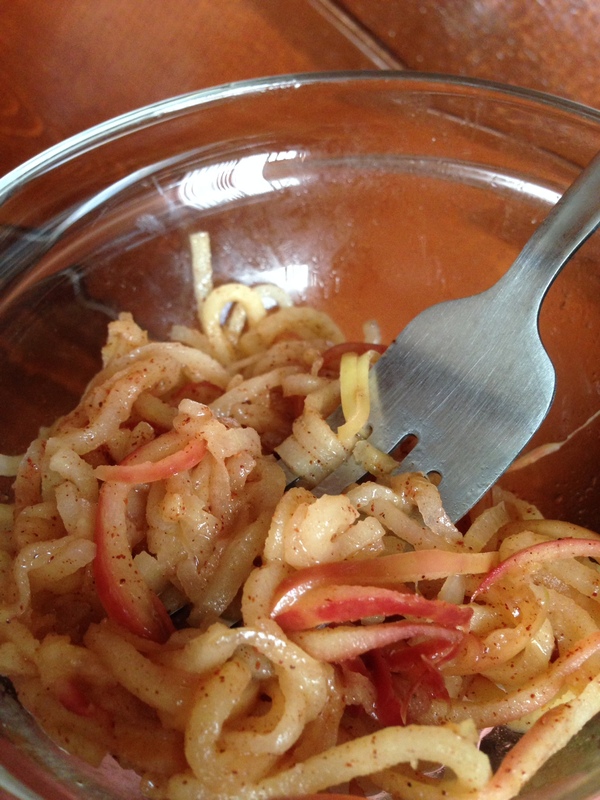 Add apples and stir until softened. 3. Add cinnamon and nutmeg and stir to mix. Serve.